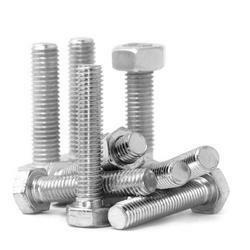 Prominent & Leading Manufacturer from Mumbai, we offer metal and alloy fasteners. With the assistance of our deft team of professionals, we are able to introduce a broad array of Metal and Alloy Fasteners. These fasteners are used in closing pipes, joining pipes, two different parts, and to stop flowing water or liquid through pipes or containers. Strong and dimensionally accurate fasteners are required for such processes; therefore, our quality controllers ensure that an excellent raw materials and modern sciences are used for fabricating the fasteners. Clients can also provide custom specifications for availing required fasteners.